Doomcrag Vampire is a legendary Endurance creature card. It is part of the Core Set. "It would appear that dinner is served." "Behold the power of the night!" "Bleed for me, mortal fool." "I can taste your fear." This card was originally of the "Undead" type rather than "Vampire". 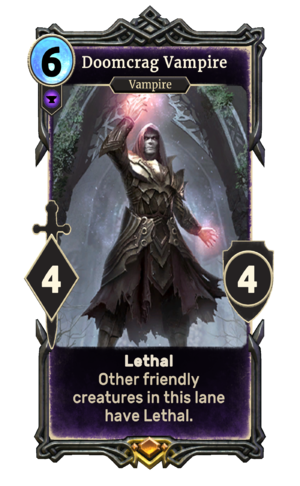 The card is named for the Doomcrag, which first appeared in ESO. This page was last modified on 24 February 2019, at 01:11.